Vincy and Grenada and used timely half centuries from their batsmen to open the Super 8 stage of the BVI Cricket Association LiME Twenty 20 League with victories over Under The Tree and New Testament Church of God (NTCOG) respectively on Sunday. In the first game, Sessie Ells was the only Under The Tree batsman posting any resistance against the Vincy bowlers with his 81 not out, as his fellow batsmen departed after short stints where they lost three early wickets, preventing them from building momentum. Vicny bowlers Turby Xavier finished with 2-42 and Bront Defreitas, 2-23. Vincy then used a stroke filled 56 from opener Monty Butler and an unbeaten 60 from skipper Austin McDowall lafter reeling at 105-4, as the foundation for knocing off the runs and picking up a crucial victory. Daley finished as the pick of the Under The Tree bowlers with 4-44. 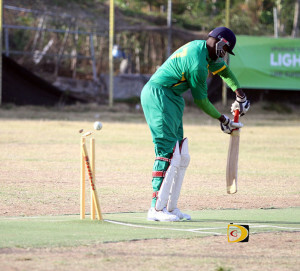 In the second match, Invited to bat, Grenada—which has scored the highest total of 383 in the tournament thus far—began it’s drive towards another victory with Derrol Redhead, the current holder of the Nagico Green Cap for most runs in the league, smashing his way to a half century inside the first seven overs. Redhead and opening partner Denron Daniel battered the NTCOG bowling at will for boundariess and sixes on the small Greenland Grounds, reaching 100 in the ninth over before Redhead was caught by Kenron Baptiste off the bowling of McTair James, for 69. Daniel continued where Redhead left off and reached his half century in the 13th over with consecutive sixes off slow left armer, Timon Robinson. In the next over, Robinson enticed him off the crease and his drive was caught by Cameron Williams while on 57. Rodney Marryshow stepped in and became the third half centurion of the innings and brought up the teams double century in the 17th over with one of his seven sixes. He sprayed the grounds for 20 runs in the 19th over before he fell for 88, helping Grenada to reach 274. NTCOG’s Travis Jack was their only bowler with two wickets, for 45 runs. Grenada’s Rodney Modeste and Marryshow were just too much for the NTCOG batsmen, bagging 3-16 and 2-53 respectively, as were all out for 126.